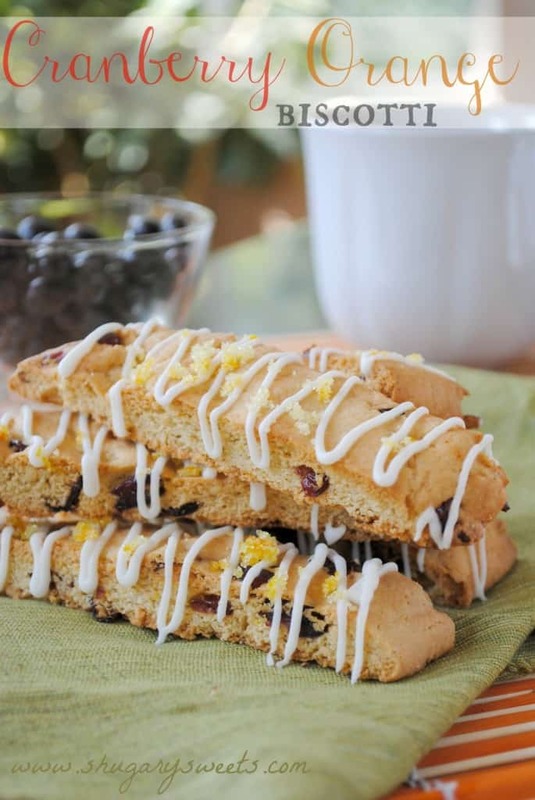 Sweet and Crunchy, Cherry Almond Biscotti is the perfect pair to your morning cup of joe, tea, or hot cocoa! I’m so in love with making biscotti. For me, it’s better than baking cookies. Yes, I just said that aloud. But think about it. 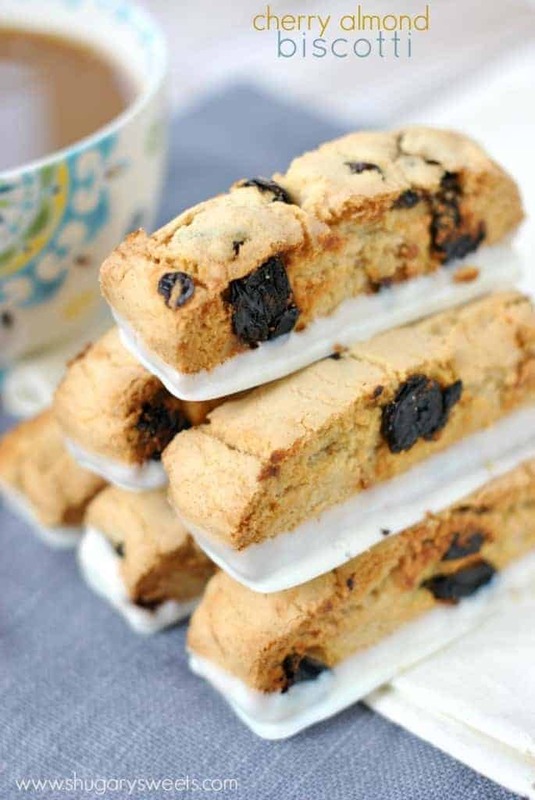 Biscotti is like a crunchy cookie. A cookie that you can eat for breakfast. Cookies that are BREAKFAST approved! 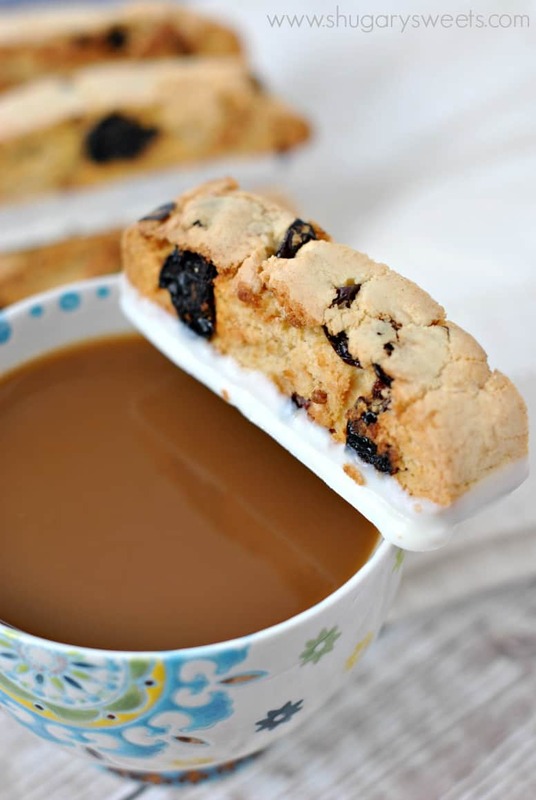 Plus, since I love having coffee in the morning (okay, and at noon, night, and whenever), biscotti is the perfect “dipper.” It’s also great dunked in tea or hot cocoa. 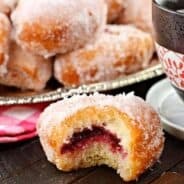 For today’s flavor, I wanted to make something that would be tasty for a Valentine’s Day breakfast. It’s not pink. But it IS cherry. 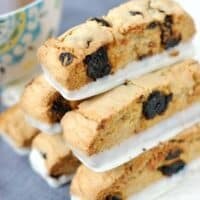 Adding in dried cherries gives a nice chewy texture with the crunchy biscotti. I also added almond extract to the dough. I love almond extract. I would put it in all my recipes if that wasn’t weird. I thought about adding some chopped almonds either to the dough or to sprinkle on top, but decided against it. The biscotti is crunchy enough, and with the dried cherries I really wanted those to shine a little brighter. 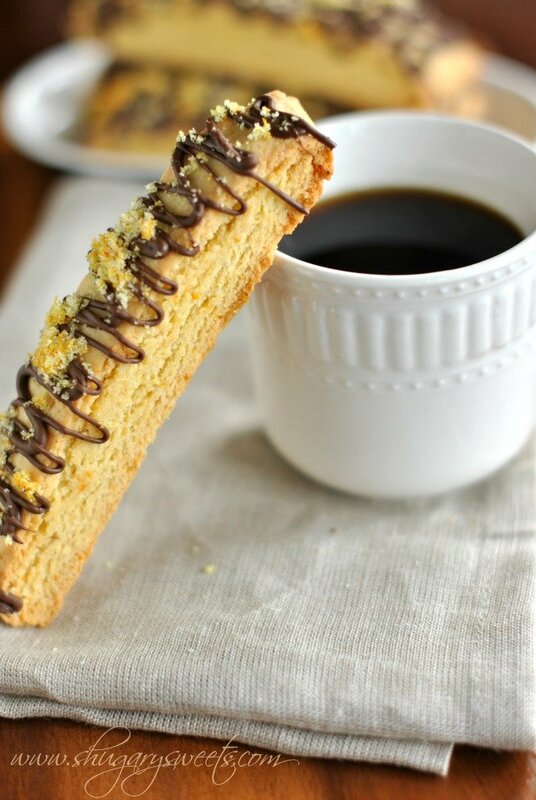 Biscotti is never complete until it’s dunked or drizzled with chocolate. (unless it’s snickerdoodle biscotti, which is lovely with a healthy dose of cinnamon sugar sprinkles.) Dipping the bottoms in Vanilla Candiquik (or almond bark) is the perfect pairing for this recipe. It’s hard to believe I used to be afraid of making biscotti. I thought it seemed so difficult. It’s NOT. I promise! Once you start making it, you may get addicted like me! In a large mixing bowl, beat butter with sugar until fully combined. Beat in extract and eggs. Add flour and baking powder and mix until blended. Fold in dried cherries. Line a large baking sheet (15x10) with parchment paper. Lay dough in center, and using your fingers, pat it into a rectangle, about 13in x 4in x 3/4in high. Bake in a 350 degree oven for 25 minutes. Remove from oven and cool for 5 minutes. Slice into 3/4-1inch thick slices. Rotate each slice onto it's side. Return to oven for 10 minutes. Rotate slices to opposite side and return to oven an additional 10 minutes. Remove and cool on wire rack. When completely cooled, dip bottom of each biscotti into melted candiquik. Set on parchment paper and allow to set for 15 minutes. Store in airtight container at room temperature for up to two weeks. Ah biscotti! Let the dunking begin. Your biscotti recipes always remind me I’ve never made it. Eaten it? Oh yes, but made on my own – not yet. I don’t understand why, especially when they are breakfast approved cookies. BREAKFAST APPROVED COOKIES. The deal is done, I’m off to my kitchen! Oh Mary Frances, you must try it soon!!! Oh my goodness these look amazing!! I can not wait to try them! I’ve never cooked with dried cherries. I’m excited to give it a whirl. And I agree with you about the almond extract. I love it and love putting a lil splash of it in everything. 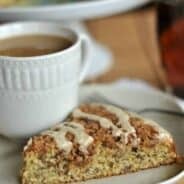 I love my evening coffee and biscotti is the perfect companion.. Thanks Aimee!!! I can’t believe you haven’t made biscotti!!! What are you waiting for girl?? 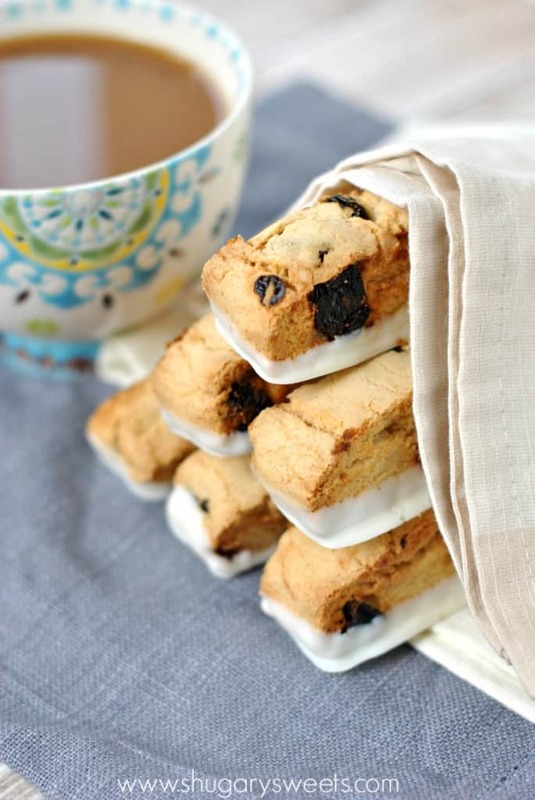 These biscotti look delicious and so gorgeous. I love these photos. Loooove biscotti! 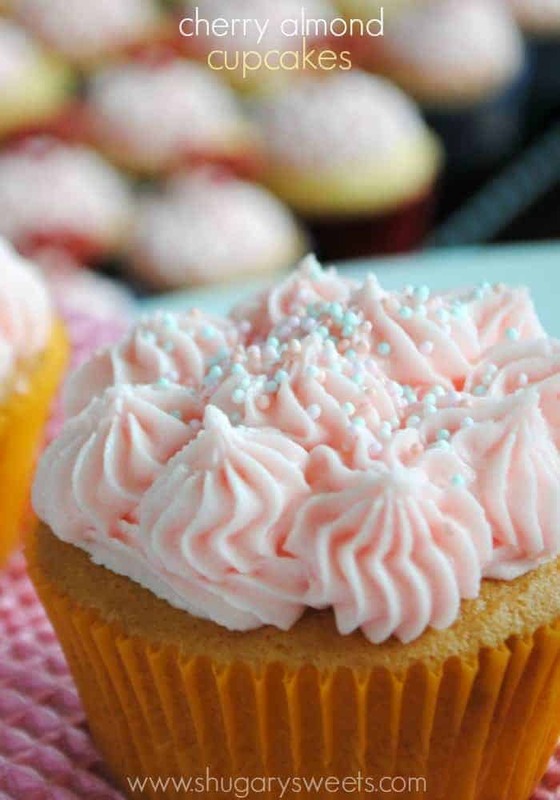 Aimee, this recipe is just perfect for V-Day or any day. Growing up in Michigan, we always had access to dried cherries and I love adding them to my baking. Thanks for sharing, girl. Pinning tonight! Oh I bet the dried cherries in Michigan are amazing! Thanks for pinning Stacy! Love the idea of putting dried cherries in as a twist for Valentines. 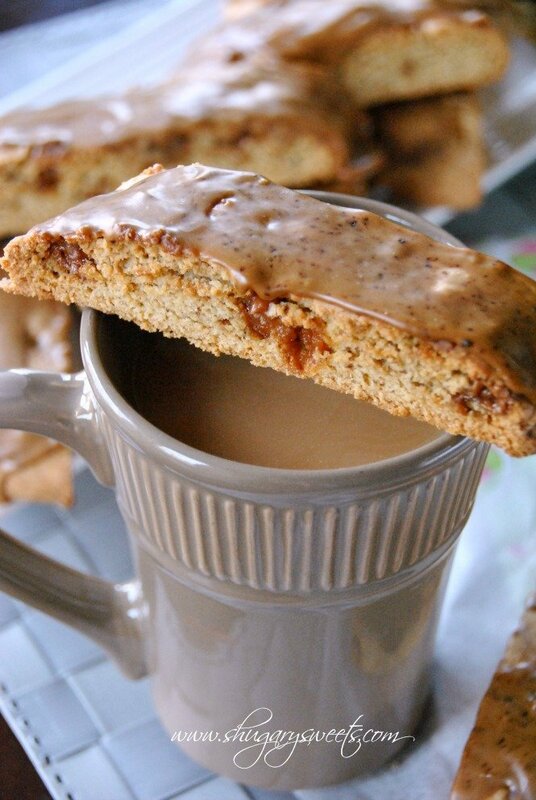 I love biscotti, so yummy with coffee. I love biscotti too! I would love a couple of these with my morning coffee tomorrow! Boy do I LOVE biscotti!! I have a bag of plump cherries from Costco and this is how I am going to use them up! 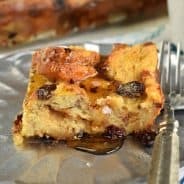 I’m with you on loving biscotti, and I need to get my you-know-what in the kitchen and make some –I have no idea what my hold up is! This flavor combination sounds delicious! 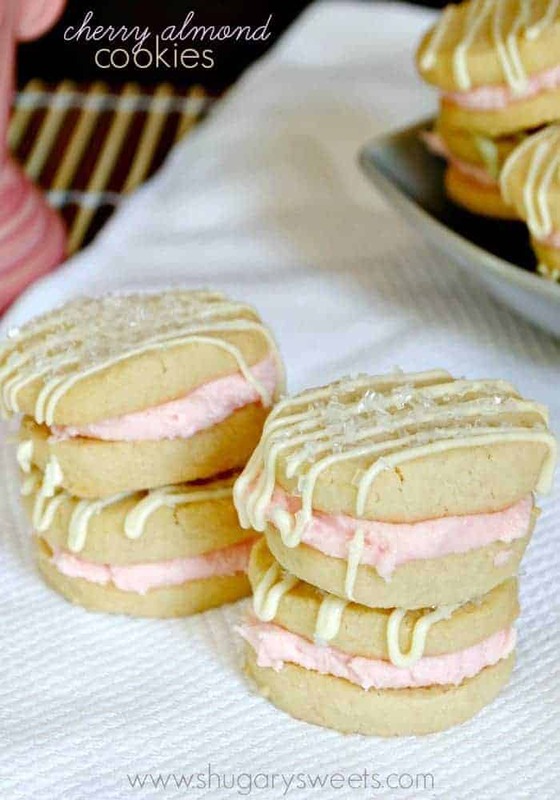 I made a version of these yesterday and this is such solid recipe and so versatile! My second batch is coming out of the oven! Thanks for a great recipe!